Added on May 13, 2007 by Chris Saad. There is an ongoing discussion about the usefulness of the pageview. Scoble has once again raised the issue as well. I'd like to make a proposal. Why can't the tools themselves - embedded players, browsers, second life clients, readers etc report back deep Attention/Engagement metrics? 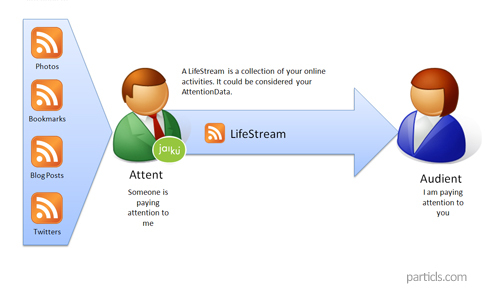 A LifeStream is an established concept and has been talked about by a number of people including Emily Chang, Stowe Boyd and others. It is an outgoing channel/record of everything you do/produce aggregated into a single feed. Consider though, that this is actually a stream of your Attention Data. Data that represents what you have paid Attention to in the past. Some call it an Attention Stream. In keeping with this theme, I would like to propose 2 additional concepts. An AudientStream (An Audient is defined as someone who pays Attention to another) is a channel/record of everything you might need to pay Attention to in the future. 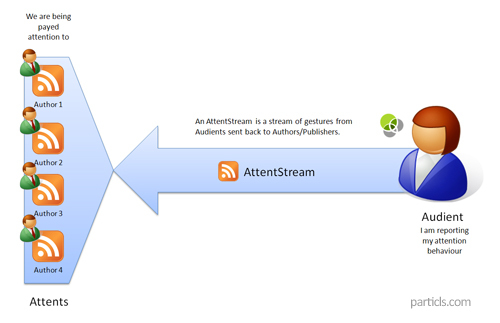 A simple example of an AudientStream might be all the RSS feeds in your OPML file aggregated together. A more sophisticated example would be an aggregated feed of your OPML file ranked against your APML file (using something like Particls). Unlike a Lifestream, it is a list of things you are YET to see. Unlike just you OPML file, it might include Twitter items, email, etc. This is where I think we can make an impact on the Pageviews and metrics problem. as someone who receives Attention from another) is a channel/record of others paying Attention to you. This would be a stream of events (preferably attributed to people) that signify Attention given to you by another. The AttentStream would come from the tools that people use to pay attention. Browsers, Readers, Embedded Players, the Flash Player, Adobe Reader, the SecondLife Client etc, etc. Because the tool itself does the reporting it can report more subtle information that can't be gathered on the server. Think of it like distributed analytics. An example of an AttentStream might be if the YouTube player reported each time a video was played - how much of the video was played and by which user. This way authors can get Attention information about content they were involved in producing. The information would not just include page impressions or views. It would include richer things like time spent, partial views etc. Each tool might produce an RSS feed that can be aggregated together by existing or new metrics companies like Compete, Buzzlogic and Feedburner. With an AttentStream one could do basic things like displaying the identity of your subscribers (those that grant permission) much like Twitter shows your followers. It could also do more advanced things like going beyond the pageview to give you more information about who is spending time on your content with or without a click. to testbed this type of system for publishers. If the community likes the idea and we come up with a concrete implementation we will be the first to provide reports to publishers about the amount of visibility their content has received from our users who opt into providing that information. This does not just mean just click throughs (which can already be measured with Analytics packages and Feedburner) but rather more subtle gestures like 'time spent' viewing the content via a popup alert or on the ticker. These are more subtle, yet equally important forms of Attention giving and engagement. This is just the beginning of an idea. Join the conversation and suggest some concrete implementations. discussing the motivations behind collecting this sort of data. I have also responded in his comments to further clarify my thoughts. In "APML", "Media 2.0", "attentstream", "audientstream", "buzzlogic", "compete", "lifestream", "metrics", "web 2.0"